Salt Spring Reads is an online book club/review. For this column I try to find books that you might love to discover, books with a Salt Spring connection. Reviewed books are available at the Salt Spring Library and in local bookstores. Feel free to share your comments to discuss this book online with others. 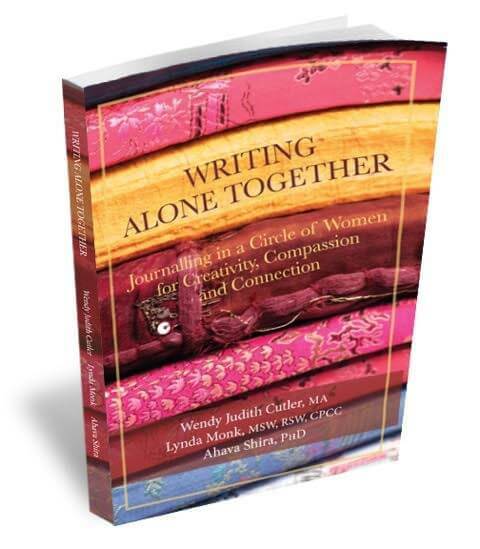 Book Review: Writing Alone Together, Journalling in a Circle of Women for Creativity, Compassion and Connection by Wendy Cutler, Lynda Monk and Ahaha Shira. If you have ever considered journalling but never taken the plunge, you might find this book helpful and supportive. Even if you are an avid journal writer, you will find much information to support you in the habit of daily or regular writing. This book is an invitation, by three Salt Spring women, to connect with others in a quest for creativity and friendship. This is not a book that teaches writing structure or how to critique. Rather, through example, the book is a dialogue to engage others in a communal writing experience. it is not an intimidating book, but one that gently encourages storytelling as a powerful tool. How journalling in a circle of women can deepen and clarify your own writing process and support you to commit to sharing your writing in the world. Margriet Ruurs is the author of over 30 books. She runs Between The Covers Booklovers’ B & B on Salt Spring Island. Her newest title is Stepping Stones, A Refugee Family’s Journey published by Orca Book Publishers.